I was nominated for this away by Brin @ Brin’s Book Blog. It means so much to be thought of for blog awards and I’m honored to have been given another. Aubrey Joy @ Point Taken — I love the name of her blog and the cheerful tone of all of her posts. Her newsletters are fun to read and she takes place in a ton of cool readathons. Emily Mead @ The Loony Teen Writer — Again, I love the spirit of this blog. She has so much fun with incorporating gifs and humor into her posts, and it’s great to read. Sumaira @ Hyper About Books — Her reviews are well thought out and written and I love reading her random rambles. Merin @ Read and Reviewed — I love all the memes Merin takes part in. Her random discussion posts and monthly State of Merin posts are great. A. E. LaGrand — This girl’s poetry is ridiculously amazing. Kara @ What Kara Reads — Her book reviews are thorough and always suggest new books for me to read. Samantha @ Strings Attached — Okay, so this one is kinda a cheat, but I’m nominating my sister, because she just got back into blogging and she’s had some great posts recently. Also, she’s my sister, so…yeah. Congratulations to everyone! Thank you for having amazing blogs and giving me great posts to read every day. No one is under any obligation to accept the award if they don’t want to, I just want to give you all a shout out for being great. 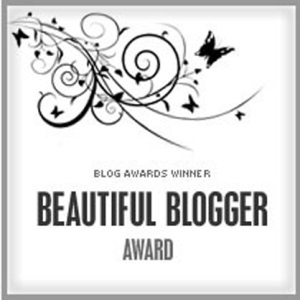 award, beautiful blog award, blog award, blogging, blogs, book reviews, my life, thanks!